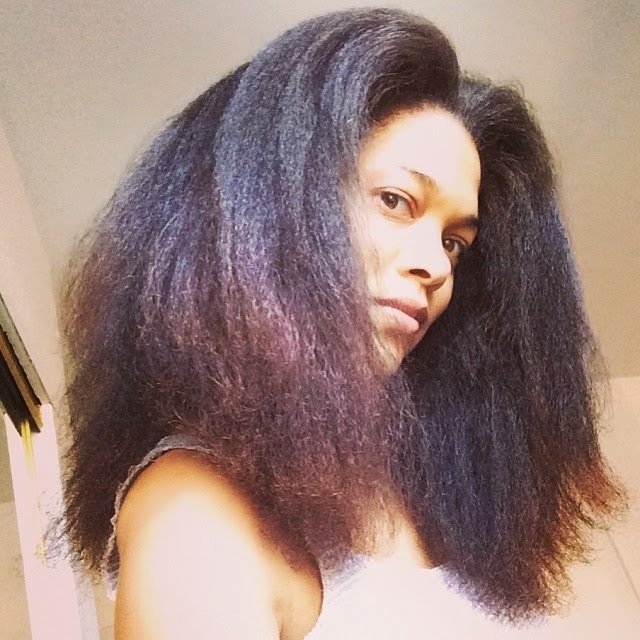 It has taken me 18 months to write this post, but I am finally ready to publicly declare my love for the Ouidad Double Detangler comb. I know that some folks aren't feeling it. Some say that it's too heavy, others say that it pulls their hair and so on. The fact is, both of those descriptions are right on the money, but are also key reasons why I love this comb more than any other I've ever used. I haven't weighed the Ouidad, but I'm fairly certain that using it should count as part of my regular workout. This same weight also has proven to be critical to my detangling process. My hair tends to bunch up in the middle, rather than tangling at the roots or the ends. The Ouidad comb is the only comb I've ever used that can not only pull through those treacherous tangles without causing breakage--and by breakage I mean that either the comb breaks my hair OR my hair breaks the comb,* but can also pull my hair firmly downward, helping to reduce the bunchy-ness (and the shrinkage that results from this bunching). It slides through large sections of my hair really quickly (with the assistance of a conditioner that has good slip), cutting the time I used to spend detangling way down. With traditional wide-tooth combs, or even with a Denman brush, it used to take me 45 minutes just to detangle. My hair is very very thick/dense, very prone to tangles and has typically been between shoulder and bra strap length (although now it is approaching mid-back). I can completely detangle with the Ouidad in 15 minutes or less. Miraculous. The price of the Ouidad comb is another reason that a lot of naturals and curly girls seem to turn their noses up at this tool, but I have to say that, for me, it was worth every penny. I bought mine at Sephora on a tax-free weekend, so I saved myself a few cents, but if it were ever lost/damaged, I would re-purchase in a heartbeat. I can't imagine going back to the torture of a regular wide-tooth. Has anyone else tried the Ouidad Double Detangler? If so, what are your thoughts on it? If you haven't tried it, what are your favorite detangling tools? Do you have any recommendations as an alternative to the Double Detangler? If you recall this post, you will know that I've already jumped head-first off the Tangle Teezer bandwagon, but I do still wonder if there's anything out there better than my beloved Double Detangler. I doubt it, but as always, I try to keep an open mind. *(Note: If you look closely at the picture above, you can see that two of the teeth on my comb are broken. My hair did not do this. Lol. I accidentally dropped the comb and it landed on the edge of the tub and two teeth broke. It still works great though). I'm intrigued. I also have very thick, tangle prone hair. It's to the point that I only wash it in loose braids for fear of tangling it up and spending hours combing it out. Weusi loves the DD ;)!! I used it once or twice, but am mostly a finger detangler now. My hair bunches in the middle now too (where my fine hair meets the coarse hair at the back of my head between my nape and crown). It's a nightmare, but the knots are so fine, I'd be totally afraid that I'd break off all of my hair using the DD!! Glad it works wonders for you though ... and, I have to say, you have me thinking about trying it out a little again ;)!! @Nettie and @Shelli Do let me know if you try it and how it works (or doesn't) for you!